Expansive Flatirons views set the scene at the new Arch11-designed Corrida in Boulder. 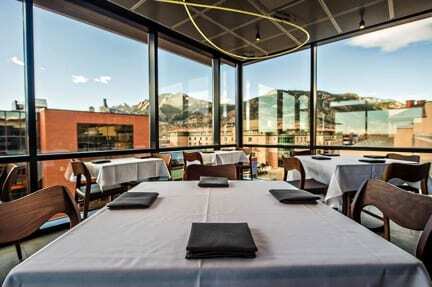 When the highly anticipated Spanish-style steak and tapas restaurant Corrida opened its doors in downtown Boulder in March, guests were greeted by warm wood and neutral hues, white linens, modern lighting and unobstructed views of the surrounding Flatirons. Designed by award-winning Denver/Boulder-based architecture firm Arch11, the new space is a modern rooftop aerie set on the fourth floor of Boulder’s PearlWest Building. Corrida owner Bryan Dayton called upon Arch11 to implement a fresh look inspired by his travels to the Basque Country of Northern Spain. Studded leather walls, neon ceiling lights reminiscent of swirling lassoes and a warm walnut bar with backlit bull skulls overhead nod to the Spanish tradition of bullfighting, while floor-to-ceiling windows and a sprawling outdoor rooftop patio with fire pits celebrate the awe-inspiring Colorado landscape. Arch11 has designed spaces for some of the hottest restaurants on Colorado’s culinary map, including Boulder’s Oak at Fourteenth and Denver’s Brider (both also owned by Dayton), as well as the Mile High City’s Whiskey Tango Foxtrot, Humboldt Farm Fish Wine, Blue Island Oyster Bar in Cherry Creek North and Sazza at Stapleton’s Stanley Marketplace. Arch11’s next culinary design project is set to open in the downtown Denver Dairy Block outpost, a hub of shops, restaurants, bars and hotels in the historic one-block space that once housed Windsor Dairy.